I have been doing some research on how to earn a lot of American Express Membership Rewards Points this year. My goal is 180,000 points for 2 Business Class Award Tickets to Portugal for next year. 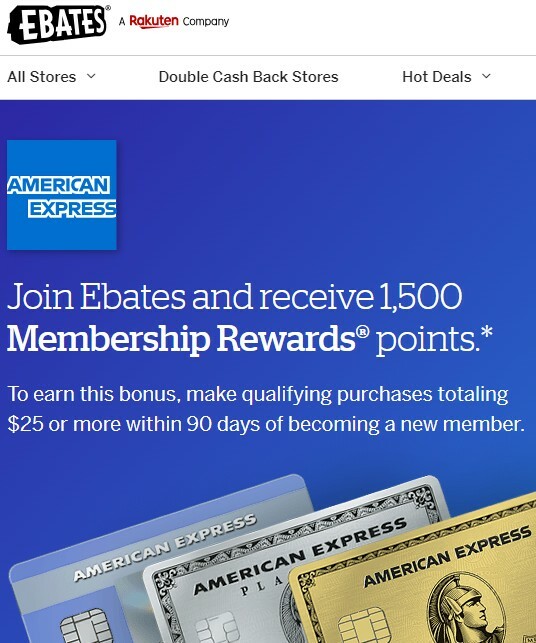 Many of the points in the article were things that I was aware of including a new feature to earn Membership Rewards through Ebates. I have been an Ebates customer for a few years and do pretty well with it, so this was interesting to me when I heard about it a few months back. Sometimes when you are on the fence about things, you get a sign. I’m taking this 1500 Bonus Rewards Points Offer as a Sign! So if you are saving up Membership Rewards points for something, you may want to open an Ebates account or if you had an account open a new one. Either way you should be able to score an easy 1500 Membership Rewards Points by simply spending $25 in your “new” Ebates account within the first 90 days. PS … You know what I always say, It pays to do your Research! Posted on April 1, 2019 April 1, 2019 by DevPosted in Money Saving Tips, Travel TipsTagged #budgettravel, #ebates, #membershiprewards, #moneysavingtips, #Travel.